Inversion • Respiratory-related visits were 35-40 percent higher during 2014 period studied. 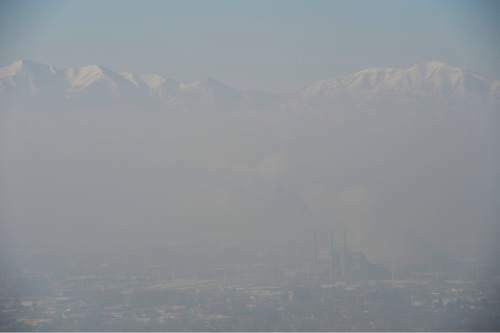 Francisco Kjolseth | The Salt Lake Tribune The Salt Lake valley is obscured by pollution by a red-air day on Wednesday, Jan. 22, 2014. Emergency room visits increased on bad air days during the winter of 2014, according to a new state analysis that shows a correlation between Salt Lake City&apos;s polluted winter air and respiratory problems. An average of 420 people went to emergency rooms on 15 days in January 2014 when pollution reached unhealthy levels in the Salt Lake City area, shows the analysis by the Utah Department of Health. The large majority of the people went for respiratory illness, with a few going for asthma. The results aren&apos;t surprising, but it will be useful for residents, lawmakers and researchers to have data to point to, said Nathan LaCross, an epidemiologist with the Utah Department of Health. "It underscores the importance of air quality on our everyday lives and people&apos;s health," LaCross said. "Having actual numbers associated with it can make it more real for people." On one particularly bad day in 2014, Jan. 3, a total of 573 people went to emergency rooms, the study shows. During the period studied, visits for respiratory and upper respiratory issues were 35-40 percent higher on bad air days. The increase was most pronounced for chronic obstructive pulmonary disease, commonly known as COPD, with emergency visits being 90 percent higher on bad air days, researchers found. Tim Wagner, executive director of Utah Physicians for a Healthy Environment, said the data confirms what his group and others have been saying for years: Utah&apos;s winter inversions are a serious health crisis. He hopes lawmakers take notice. "Somehow, these kinds of events are treated by some, not all, like it&apos;s just a fact of life living in Utah along the Wasatch Front," Wagner said. Utah&apos;s winter inversions are a phenomenon in northern Utah&apos;s urban corridor caused by weather and geography. Cold, stagnant air settles in the bowl-shaped mountain basins, trapping tailpipe and other emissions to create a brown, murky haze that engulfs the metro area. Doctors warn that breathing the polluted air can cause lung problems and other health concerns. Schools regularly cancel outside recess for kids on bad air days, and runners and hikers sometimes skip workouts to avoid health problems. Senior citizens, young children and people with asthma are most susceptible to falling ill during the bad inversion days when tiny particles fill their lungs, Wagner said. For people already dealing with health problems, a short amount of time in the air, such as 15 minutes, can trigger problems, Wagner said. Utah state legislators and officials are actively working on the problem, with legislation introduced each year. State officials ban wood burning on many days, and they constantly plead with residents to carpool and take other measures to cut down on pollution. Utah health officials note in the analysis that more years of data are needed to bolster research on the topic. A similar study of 2015 data is planned.